If there is more fun to be had on four legs, then I would like to know about it. 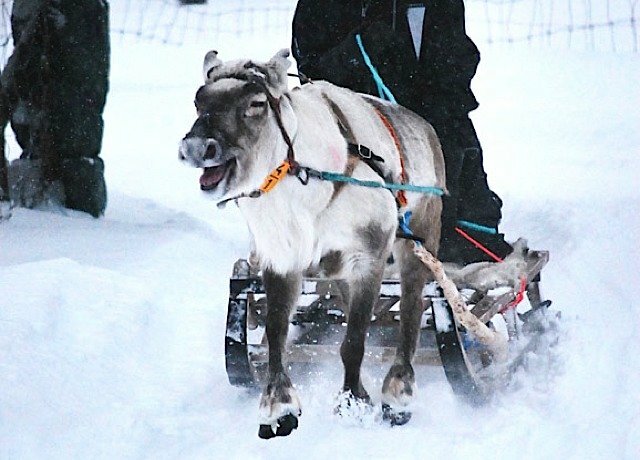 During a recent work trip to Swedish Lapland and the Arctic Circle town of Kiruna, reindeer sledding was on the itinerary. I imagined it would be sort of like a pony ride except, well, with reindeer doing the slow plodding. Not even close. 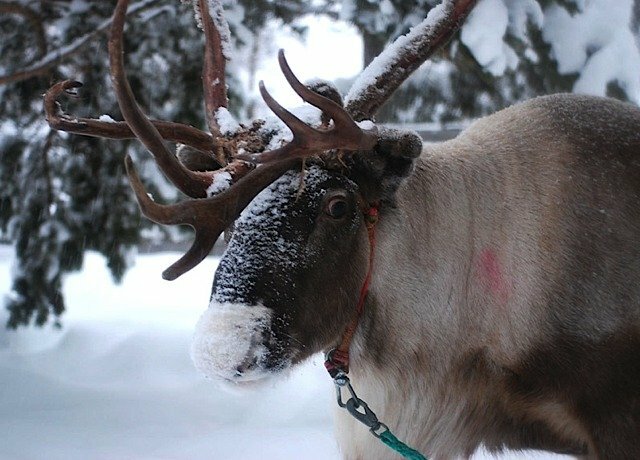 Reindeer are deeply intertwined with the culture of the Sami people – indigenous people of the Arctic living primarily in Norway, but also in the northern reaches of Sweden and Finland. While certainly less to an extent today in wealthy and modern Scandinavia than in times past, many Sami still rely on their reindeer herds for food, skins for clothing, transport and more. 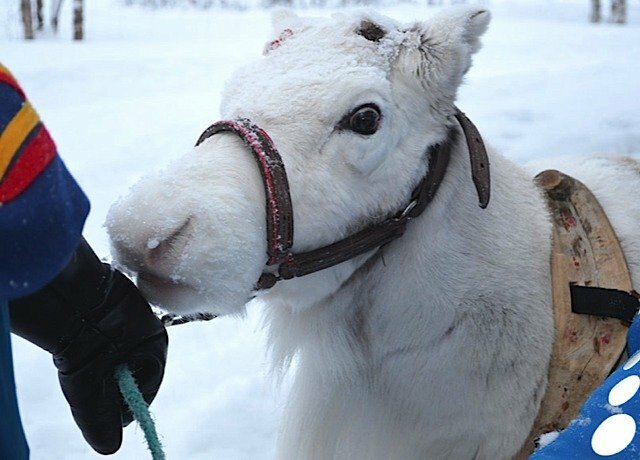 And any reindeer you see roaming about northern Sweden, tossing its antlers about in the snow searching for a snack, certainly belongs to a Sami. I saw a fascinating documentary a few years ago called “Reindeer Girls” that followed two Sami cousins from Northern Norway as they traveled with their migrating herds through the fjords (the reindeer even ford the deep waters to reach feeding grounds rich with lichens and moss during the spring and summer months). An experience like traveling with the Sami on a reindeer migration is now squarely on my bucket list. But for now, at least, reindeer sledding will do. The animals are short and stout and incredibly well adapted to their surrounds, with ultraviolet vision that allows them to better spot lichen (which do not reflect UV light) under the snow and protects their eyes from the harsh rays reflecting off the snow. 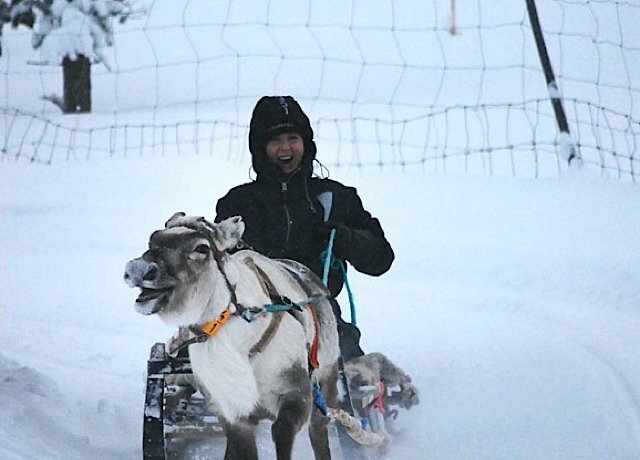 The Sami have long harnessed reindeer to haul their supplies atop wooden sleds, and it’s not surprising the practice has tourism value these days. In Northern Norway, I was once pulled by reindeer across a frozen lake in search of the Aurora Borealis. But here in Lapland, there was a need for speed and it’s shocking how quickly the reindeer can gallop (if that’s what it’s called) as they peeled around the corners of a track of sorts, even causing the sled to catch air at a few points during the ramble. I kept thinking how such extreme sledding would probably never be officially allowed in America, due to liability and what not (nope, I wasn’t wearing a helmet). I’ve discovered some killer sledding spots across Europe over the years, through UNESCO World Heritage spots in Switzerland and in the moonlit Austrian Alps. And reindeer sledding reminded me a lot of another high-adrenalin winter activity I tried once in the French Alps – ski joëring, a practice that originated in 2,500 BC in Sweden where you ski (much like being pulled on water skis behind a boat) behind Icelandic fjord horses that erupt into a full-on gallop. Have I mentioned how much I love Europe? Wow that sounds like so much fun, especially catching some hang time. Where in the world are you off to next? I love these posts and I wish you would update them more often, you have quite the fan club out here that lives vicariously through you! I hope our paths cross again in the near future, I miss you Terry.